ABS-CBN Lingkod Kapamilya Foudation’s Bantay Kalikasan, together with Bayan Mo iPatrol Mo (BMPM) of ABS-CBN News and Current Affairs and valuable partners, joined the 32nd International Coastal Clean-up day by conducting simultaneous volunteer coastal or river clean-up activities to 11 sites. With over 5,767 volunteers, approximately 79,438 kilos of waste were collected in the 11 clean-up sites which include Metro Manila, Romblon, Zambales, Guimaras, Batangas, Palawan, Sarangani, Sorsogon, and Tacloban – two sites each for Sorsogon and Tacloban. 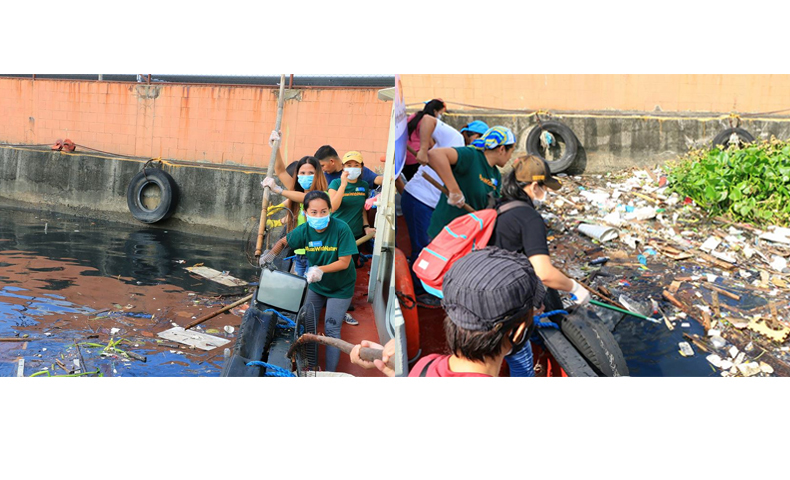 Left: Bantay Kalikasan staff and volunteer gets a screen of a television in San Juan River Right: BK staff and volunteers scoop trash floating in San Juan River. The collected PET bottles from the clean-up will be donated to Bayan Mo iPatrol Mo which they will sell to buy mobilized wheelchairs for Tahanang Walang Hagdan. This is part of BMPM’s 10th anniversary. By working together, Bantay Kalikasan believes that everyone can create a bigger impact to the community and to the environment.